The Holiday Getaway Sweepstakes is open to legal residents of the fifty (50) United States and District of Columbia who are 21 years of age or older. 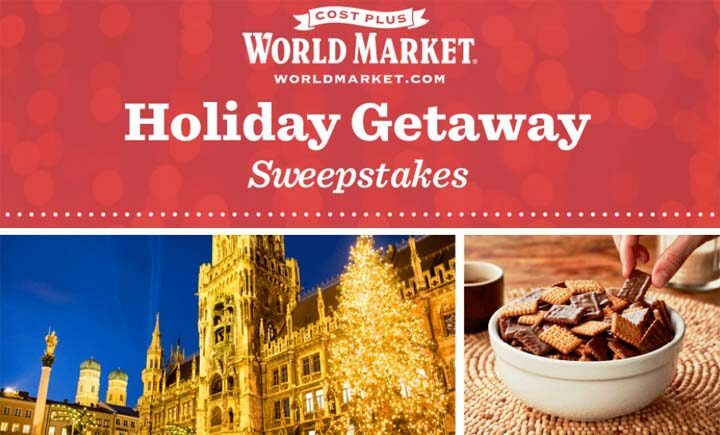 The Holiday Getaway Sweepstakes ends at 11:59 p.m. ET on September 29. During the period, visit worldmarketsweepstakes.com and follow the provided instructions to complete and submit the online entry form. Limit one (1) entry per person per day. GRAND PRIZE (1): A trip for winner and one (1) guest to Munich, Germany. Trip consists of round-trip coach class air transportation from a major U.S. international airport nearest winner’s residence to Munich, Germany, five (5) days and four (4) nights hotel accommodations, ground transportation to/from airport and hotel, a local Munich city tour for winner and guest, a dinner for winner and guest, a Bahlsen gift basket, and a $1,000 World Market Gift Card for winner only. Approximate Retail Value (“ARV”) of Grand Prize package: $7,620.00. Total ARV of all prizes: $9,120.00.